This powerful integration now lets you combine two robust workflows into one. 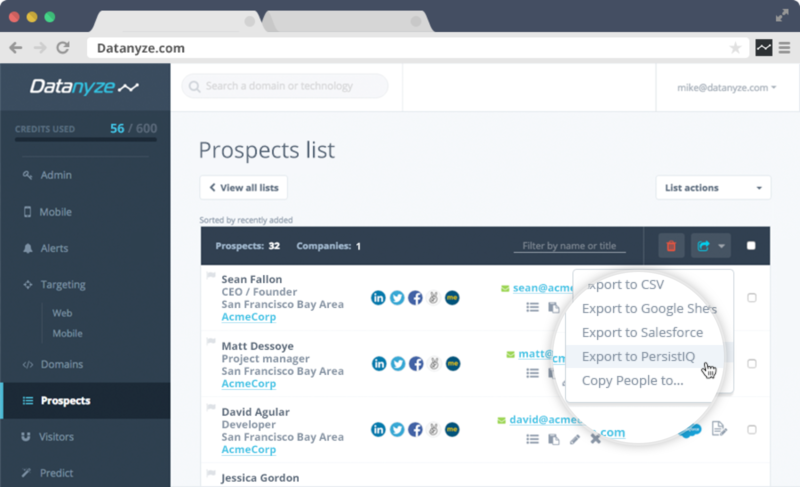 Find and build a targeted lists of prospects using Datanyze, then drop them into a live PersistIQ sales campaign with one click. From PersistIQ, launch a highly personalized multi-touch campaign to your list in just minutes. Get valuable information on which technologies are used by which companies. Find prospects at those companies and build lists with the information you need to reach out. Push selected leads or entire lists into a your PersistIQ leads database or a specific campaign with the click of a button. While working in Datanyze, you can push leads into any outbound sales campaign or add them to your general leads database to follow up with later. PersistIQ give you the power to create as many touches as you need, spaced out over any amount of time that you define, allowing you to personalize your outbound sales at scale.